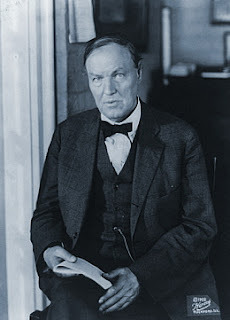 Clarence Darrow delivered “A Plea for Mercy” at the Sept 1924 trial of Nathan Leopold and Walter Loeb, who were two Jewish wealthy University of Michigan alumni and University of Chicago students who murdered 14-year-old Robert “Bobby” Franks in 1924 and were sentenced to life imprisonment. They were motivated to murder Franks by their desire to commit a perfect crime. Once apprehended, Leopold and Loeb retained Clarence Darrow as counsel for the defense. Darrow’s summation in their trial is noted for its influential criticism of capital punishment and retributive, as opposed to rehabilitative, penal systems. Darrow succeeded. The judge sentenced Leopold and Loeb each to life imprisonment (for the murder) plus 99 years each (for the kidnapping). Loeb was murdered while in prison by another inmate. In 1958, after 33 years in prison, Leopold was released on parole. He died in 1971. Now, your Honor, I have spoken about the war. I believed in it. I don’t know whether I was crazy or not. Sometimes I think perhaps I was. I approved of it; I joined in the general cry of madness and despair. I urged men to fight. I was safe because I was too old to go. I was like the rest. What did they do? Right or wrong, justifiable or unjustifiable — which I need not discuss today — it changed the world. For four long years the civilized world was engaged in killing men. Christian against Christian, barbarian uniting with Christians to kill Christians; anything to kill. It was taught in every school, aye in the Sunday schools. The little children played at war. The toddling children on the street. Do you suppose this world has ever been the same since? How long, your Honor, will it take for the world to get back the humane emotions that were slowly growing before the war? How long will it take the calloused hearts of men before the scars of hatred and cruelty shall be removed? We read of killing one hundred thousand men in a day. We read about it and we rejoiced in it — if it was the other fellows who were killed. We were fed on flesh and drank blood. Even down to the prattling babe. I need not tell you how many upright, honorable young boys have come into this court charged with murder, some saved and some sent to their death, boys who fought in this war and learned to place a cheap value on human life. You know it and I know it. These boys were brought up in it. The tales of death were in their homes, their playgrounds, their schools; they were in the newspapers that they read; it was a part of the common frenzy — what was a life? It was nothing. It was the least sacred thing in existence and these boys were trained to this cruelty. Your Honor knows that in this very court crimes of violence have increased growing out of the war. Not necessarily by those who fought but by those that learned that blood was cheap, and human life was cheap, and if the State could take it lightly why not the boy? There are causes for this terrible crime. There are causes as I have said for everything that happens in the world. War is a part of it; education is a part of it; birth is a part of it; money is a part of it — all these conspired to compass the destruction of these two poor boys. Has the court any right to consider anything but these two boys? The State says that your Honor has a right to consider the welfare of the community, as you have. If the welfare of the community would be benefited by taking these lives, well and good. I think it would work evil that no one could measure. Has your Honor a right to consider the families of these defendants? I have been sorry, and I am sorry for the bereavement of Mr. And Mrs. Frank, for those broken ties that cannot be healed. All I can hope and wish is that some good may come from it all. But as compared with the families of Leopold and Loeb, the Franks are to be envied — and everyone knows it. Here is Leopold’s father — and this boy was the pride of his life. He watched him, he cared for him, he worked for him; the boy was brilliant and accomplished, he educated him, and he thought that fame and position awaited him, as it should have awaited. It is a hard thing for a father to see his life’s hopes crumble into dust. Should he be considered? Should his brothers be considered? Will it do society any good or make your life safer, or any human being’s life safer, if it should be handed down from generation to generation, that this boy, their kin, died upon the scaffold? Now, I must say a word more and then I will leave this with you where I should have left it long ago. None of us are unmindful of the public; courts are not, and juries are not. We placed our fate in the hands of a trained court, thinking that he would be more mindful and considerate than a jury. I cannot say how people feel. I have stood here for three months as one might stand at the ocean trying to sweep back the tide. I hope the seas are subsiding and the wind is falling, and I believe they are, but I wish to make no false pretense to this court. The easy thing and the popular thing to do is to hang my clients. I know it. Men and women who do not think will applaud. The cruel and thoughtless will approve. It will be easy today; but in Chicago, and reaching out over the length and breadth of the land, more and more fathers and mothers, the humane, the kind and the hopeful, who are gaining an understanding and asking questions not only about these poor boys, but about their own — these will join in no acclaim at the death of my clients. I feel that I should apologize for the length of time I have taken. This case may not be as important as I think it is, and I am sure I do not need to tell this court, or to tell my friends that I would fight just as hard for the poor as for the rich. If I should succeed, my greatest reward and my greatest hope will be that for the countless unfortunates who must tread the same road in blind childhood that these poor boys have trod — that I have done something to help human understanding, to temper justice with mercy, to overcome hate with love.